Spring Arbor University is proud to celebrate Martin Luther King Jr. Day with a day of community service in Jackson County. On Monday, January 16, at 1 p.m., members of the Spring Arbor and Jackson community are encouraged to meet in the Spring Arbor University Fieldhouse to launch a day of giving back to the place they call home. 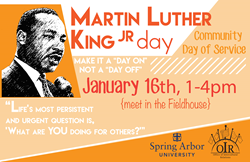 Spring Arbor University’s Office of Intercultural Relations (OIR) is heading up the event, encouraging students, university personnel and community members to make the holiday a “day on,” rather than a “day off," in honor of Martin Luther King Jr.'s dedication to improving the lives of others. Eric Beda, the director of OIR, has been rallying for support, and expects this year to hold a successful turnout. All are welcome to participate in this day of service. It will run from 1-4 p.m.